On Thursday afternoon, Larry Charles Harvey, 27, allegedly started his crime spree by stealing a truck, which he later crashed. He then allegedly stole a ranch utility vehicle he drove to a home he burglarized. He then left the area driving another stolen car. On Friday, a witness spotted Harvey outside a residence in the 100 block of South 7th Street in Shandon. Officials had considered Harvey armed and dangerous and residents were advised to lock their doors, secure their vehicles, and to not leave keys inside their vehicles. When deputies arrived on the scene, Harvey ran away. 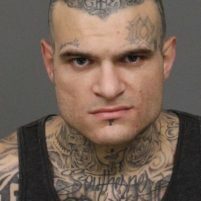 He led Deputies on a foot chase through a nearby riverbed, into backyards, and through a home before deputies caught him near the intersection of Calle Carmelita and E. Centre Street in Shandon. Harvey was arrested without incident. Don’t’ need to provide your name; but I wonder how many of us would just love, and I mean really love, to take some 80 – 100 grit sandpaper (with or without a power sander) to these tattoos. This type of guy is the reason we used to have tough laws, but with reforms in bail and sentencing I expect he will be out by Tuesday and if convicted serve one whole year in county jail..
I’m having a mid life crisis and am considering a shaved head with some tats on the side. After seeing this look, I’m reconsidering the look. Hum..another central Coast winner. Sad to see the CC as the leader in scum. Some just dont look the part. Tell me there’s hope for rehabilitating this gem.